& Air Conditioning Engineers) . ASHRAE also publish his Handbook which is followed worldwide to design any kind of HVAC System. While designing HVAC System, architectural drawing layout is must which specify location of each and every material and its respective location. This layout is then provided to HVAC Consultants and they calculate Heat Load of the location they need to cool off. 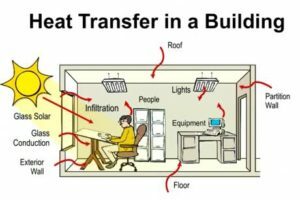 For calculating Heat Load, U Factor( Overall Heat Transmission Coefficient) is calculated for each and every kind of wall material,roof material, equipment’s generating heat. Also, latitude, longitude, Orientation, Direction, Geographical location, Glass area plays a vital role in Heat Load Calculations. Heat Load is calculated generally in terms of BTU ( British Thermal Units). Once Heat Load is calculated, cooling tonnage capacity comes into picture which tells about how much value of TR ( Tonnage of Refrigeration) machine is required to offset the heat generated in the room. As a thumb rule, 150 square feet area can be cooled by 1 TR of machine. A drawing is then created by draughtman who locate positions of the required cooling machines, cooling accessories, Duct Layout to the Project Engineer. Hence, HVAC Design is the back bone for any project to be successfull.